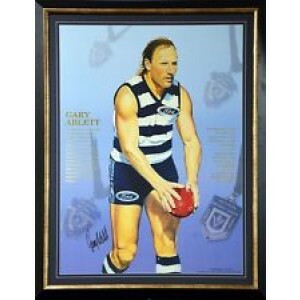 Gary Ablett ranks as one of the game’s most talented players of all time. Dynamic on the field, quiet and unassuming off the field. His performances in the 1989 Finals Series were electrifying - kicking 27 goals in four finals matches, as well as winning the Norm Smith medal for nine goals in the Grand Final. Gary had the ability to attract people to football matches just to watch him play, a quality that defines his standing in the game. This rare print by John Christie captures the great Gary Ablett Senior lining up for goal. Limited in edition to 750 units worldwide, the print is hand signed by Gary Ablett and the COA is signed by artist John Christie. Secure your piece of Geelong history! Congratulations to Geelong Cats superstar Patrick Dangerfield on a stellar 2016 season, capped off by winning his first Brownlow Medal. Widely regarded as the most electrifyingly quick and outrageously strong midfielder in the competition, Dangerfield’s arrival at the Cats saw him amass 43 disposals in a peerless display against the reigning Premiers. This start to his season was merely a sign of things to come for the adopted Cat as his 2016 saw a level of dominance rarely equalled in the history of the game. Having been voted the AFLPA MVP by his peers in the weeks preceding the count, his first Brownlow Medal is a most deserving honour for a true AFL star, one both loved by the Cats army and respected by opposition fans across the country. 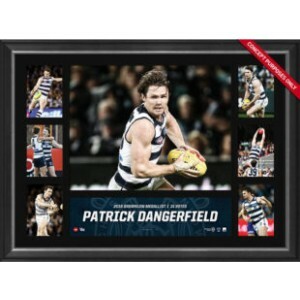 Geelong Cats, in conjunction with the Australian Football League, is proud to release the Patrick Dangerfield Framed Brownlow Sportsprint. Officially licensed and strictly limited, it is a must-have for all Cats fans and astute collectors alike. This stunning framed piece celebrates Geelong's AFL Premiership wins over the club's history. Including their 2016 team photo, along with imagery of the team's star players, this is perfect for any fan wanting to remember the club's past glories, with the premierships and club records listed. This is perfect for any true Geelong Football Club fan wanting to own a piece of Cats' history. p>This stunning framed piece celebrates the amazing Geelong and its 2016 season. Including their 2016 team photo, along with the club's 2016 playing fixture, with the names of each of the players listed below. This is perfect for any true Geelong Football Club fan wanting to own a piece of Cats history. Relive the past glories of the Cats – or surprise your favourite die-hard Geelong fan! Features both action images of the stars in full flight, and celebration images from Geelong's 2007, 2009 and 2011 Premierships.